Occupying an attractive semi-rural setting, on the very edge of Penryn, overlooking and backing onto unspoilt countryside, a detached 3-bedroomed bungalow, providing well presented, gas centrally heated and double glazed accommodation, with 2 conservatories, to the front and the rear, standing in pretty, well stocked gardens, bordered to the rear by a picturesque stream, and with off-road parking in addition to a detached garage with store below. 21 Lanoweth is a detached bungalow, lovingly maintained by the present owners, situated on the extreme edge of Penryn, backing onto a picturesque stream with open countryside beyond. Benefiting from double glazing, gas central heating and two sets of solar panelling providing subsidised heating and hot water, the bungalow is set within attractively stocked and landscaped gardens which, albeit sloping, provide a good degree of privacy and attractive aspect from all main rooms. Off-road parking in addition to the garage is provided at road level, with steps leading down to either side of the property and, beyond, to the rear gardens. There is a useful store under the garage and particularly attractive rear gardens feature sitting-out terraces, a pond and many specimen plants including acer, camellias, azaleas, flowering quince, rhododendrons, hydrangeas and lilac etc. From the front elevation, an entrance porch leads into the reception hall, off which there is a well proportioned living room with open fireplace with log-burner and sliding double glazed doors to the front conservatory. The kitchen, to the rear, opens into the second conservatory which is currently used as a dining room by the owners, and accessed from the kitchen is a large cellar (of limited head height), ideal for storage etc. 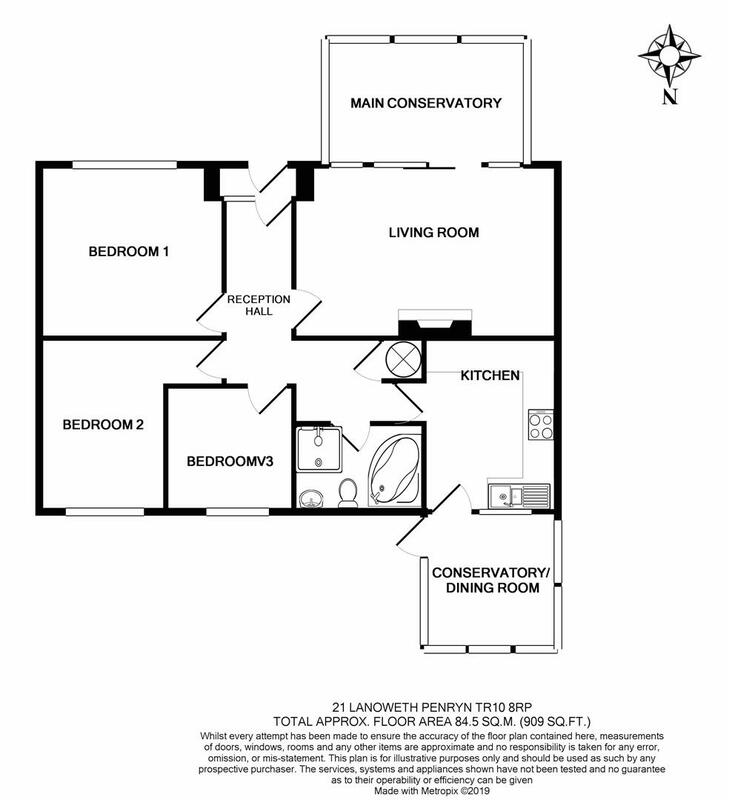 Two bedrooms are double in size, with the third bedroom ideal as a child's room or study etc, and the family bath/shower room has been attractively appointed with a white four-piece suite including a separate shower cubicle. Lanoweth is situated on the northern edge of Penryn, within walking distance of the university campus at Tremough, and an approximate ten/fifteen minute walk from the railway station and town centre. A nearby bus stop provides an extremely regular service to Penryn, Falmouth, Truro and beyond, with Falmouth just three miles distant and the cathedral city of Truro, nine miles away and readily accessed by the A39. A bright and centrally positioned entrance hall with matching doors to the living room, kitchen, three bedrooms and bathroom. Door to a fitted airing cupboard with hot water cylinder and slatted shelving. Ceiling loft hatch and radiator. A particularly well proportioned living room featuring broad sliding uPVC double glazed doors to the main conservatory, with matching double glazed units either side. Fireplace with inset/recesses wood-burner featuring a natural stone hearth and mantel. Two radiators. A particularly spacious conservatory which overlooks the enclosed and terraced front garden, with tall Anglian uPVC double glazed units featuring side and over-head opening windows. Tiled floor, two radiators. Providing comprehensive worksurface space with many oak-fronted storage cupboards and drawers at base and eye level, with tiled splashbacks in between. Inset one and a half bowl stainless steel sink with mixer tap and drainer, four-ring electric hob with extractor hood over, electric oven/grill. Fitted cupboard suitable for a fridge or freezer. Timber stable door with multi paned glazing accesses the conservatory, with window adjacent. Access to under-floor 'cellar' storage. Providing a superb elevated position in which to observe the beautiful rear garden and stream below, fitted with quality Anglian uPVC double glazed units, with opening windows to the side elevations and door with steps leading to the patio terrace and garden below. Radiator. Over-head opening window. A particularly bright and well proportioned double bedroom with broad uPVC double glazed window to the front elevation, radiator under. Measurements exclude door entrance recess. Another double bedroom with a lovely aspect over the rear garden and unspoilt farmland beyond, with uPVC double glazed windows to the rear. Another bright bedroom, a perfect child's bedroom/single or study if required. uPVC double glazed window to the rear elevation, again enjoying the unspoilt views, radiator under. Featuring a white four-piece suite comprising a corner bath unit with built-in seating area, low flush WC, pedestal wash hand basin and a corner shower cubicle with sliding doors and Mira mixer shower attachment. Half height wall tiling and radiator. Broad obscure double glazed window to the rear. With high secure timber fencing to the front boundary, attractive terraced gardens descend to the front entrance, with attractive dry stone retaining wall, raised lawned areas with various flowering shrubs and plants. Steps to one side provide pedestrian access to the front entrance, with secondary timber steps leading from the detached garage and driveway parking. Access to the rear garden on both sides of the bungalow. Featuring a delightful raised patio terrace adjacent to the rear conservatory/dining room, a superb position in which to overlook the mature, particularly well stocked garden, with stream towards the rear boundary, beyond which is unspoilt farmland and lightly wooded area. The lower garden comprise gravelled steps and slate-laid pathways leading to a lawned area. Fenced and walled side boundaries. Providing vehicular access to the detached garage and off-road parking for one vehicle. Recently tarmacadamed. Block-built, featuring a door from the rear garden. Power connected, small timber window to the rear. From the A39 and roundabout at Treliever, take the left-hand turning signposted to the university campus. Proceed down the hill, passed the entrance to the university and immediately after the bus stop, turn left into Trewarton Road, passing the Kingdom Hall of Jehovah's Witnesses on the left-hand side. Proceed up the hill and turn left into Bodinar Road. Follow this road around and Lanoweth is the second cul-de-sac on the left-hand side. Number 21 is positioned at the right-hand side at the foot of the steep hill.